After playing indoors at the AT&T stadium in Dallas for three years (2014,15,16), Nissan Stadium in Nashville (2017), and Arrowhead Stadium in Kansas City (2018) it is time to take the show to the west - Broncos Stadium at Mile High in Denver, Colorado!. 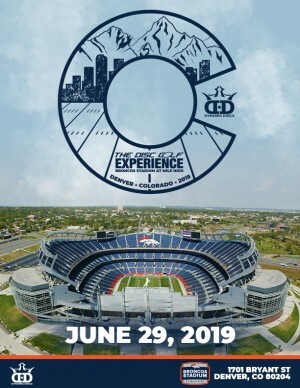 On June 29th, Dynamic Discs will plant a basket on the 50 yard line on the field where the Denver Broncos play football. Nine holes of unique disc golf will be set up inside the stadium. This opportunity is offered nowhere else. Along with the incredible experience offered, there will be an awesome player's pack with a few one-of-a-kind discs. 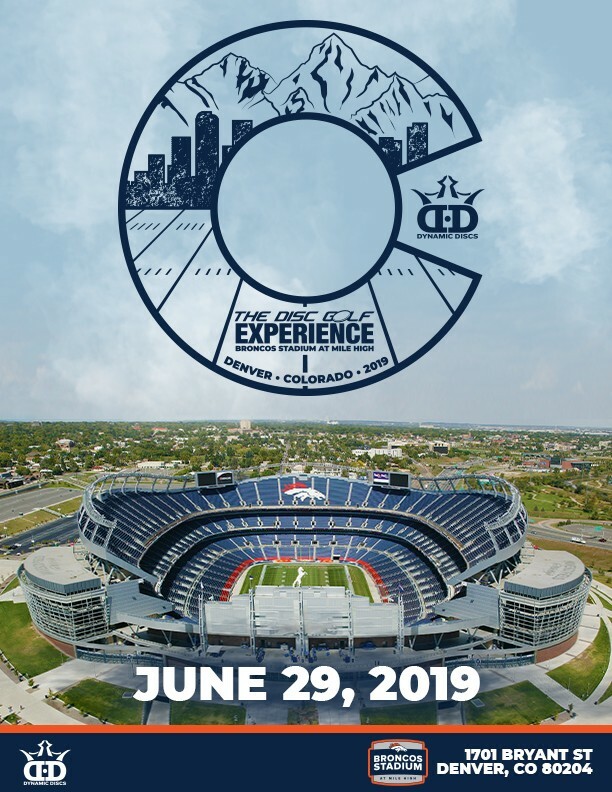 Will you be there to listen to your name being announced on the first tee or will you listen to everyone else tell their stories of how they had a "mile high" shot in Denver? Q. What is included in the VIP Package? A. The VIP package will include tee times between 3:30PM and 6PM. At the end of the evening, VIPs are invited to attend an exclusive party in the Club Level of the stadium. VIPs will also have the opportunity to throw a special CTP hole from the Club Level to the 50 yard line! Drinks (open bar) and light fare will also be provided for the VIPs! VIPs will have first priority to purchase the actual portable Patriot baskets used in the stadium for the event. VIPs will also be joined on a hole during their round by either 2018 PDGA World Champion Paige Bjerkaas or 2010 PDGA World Champion Eric McCabe. Q. When can I register for the event? A. Friday, March 1 at noon p.m. Central. Q. When will I tee off? A. You will select available tee times when you register. Q. What if I want to be able to play with people I know? A. You will have the option of registering up to 8 people at one time for a tee time. Q. How will the others pay if I register more than 1 person? A. You will need to designate 1 person that will pay for the others at the time of registration. Q. What if my spouse or significant other does not want to play but just wants to walk with me as I play? A. They will need to purchase the Player Pack Experience ($44) which allows them to be on the course. Q. What if I want to bring my kids with me? A. Kids 12 and under will be able to accompany their parents on the course but will not be able to play the course. Kids 13 and up will need to purchase tickets according to the level they want to participate. Dynamic Discs is responsible for all refunds/cancellations. If you need to cancel for any event, it must be made by email to [email redacted]. Cancellations more than 15 days in advance from the event will receive a full refund minus a $5 processing and cancellation fee. Cancellations under 15 days from the tournament date will be refunded in dynamicdiscs.com store credit equal to the entry fee minus a $5 processing and cancellation fee. Cancellations after June 26th will not receive any refund. Disc Golf Experience Badge and Lanyard, a premium custom-stamped midrange from Latitude 64, a new-release putter from Dynamic Discs, 9 Holes of Disc Golf, Field and Stadium Access. VIPs will play a hole with either 2018 PDGA World Champ Paige Bjerkaas or 2010 PDGA World Champ Eric McCabe! At the end of the day, VIPs will be able to attend an exclusive party in the Club Level of the stadium. VIPs will also have the opportunity to throw a special CTP hole from the Club Level to the 50 yard line for some fantastic prizes! Drinks and light fare will be provided for the VIPs! VIPs also have first priority to purchase the actual portable Patriot baskets used in the stadium for the event. Choose your tee time. 8 player max per tee time. Disc Golf Experience Badge and Lanyard, a premium custom-stamped midrange from Latitude 64, a new-release putter from Dynamic Discs, 9 Holes of Disc Golf, Field and Stadium Access. Choose your tee time. 8 player max per tee time. Disc Golf Experience Badge and Lanyard, a premium custom-stamped midrange from Latitude 64, a new-release putter from Dynamic Discs, Field Access to walk with group. Disc Golf Experience Badge and Lanyard, Limited Stadium Access. No access to field or disc golf course, Kids 12 and under will be able to accompany their parents on the course but will not be able to play the course. Disc Golf Experience Badge and Lanyard. Non-playing VIPs will be able to attend an exclusive party in the club level of the stadium from 6:30PM to 8:30PM. Drinks and light fare will also be provided for the non-playing VIPs!